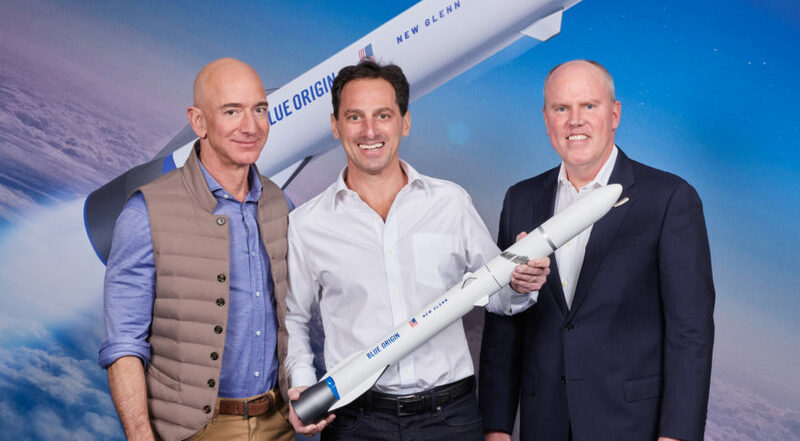 From left to right: Jeff Bezos, founder of Blue Origin; Dan Goldberg, CEO of Telesat; and Bob Smith, CEO of Blue Origin. Credit: Blue Origin. WASHINGTON — Canadian fleet operator Telesat has agreed to launch satellites for its future low-Earth-orbit broadband constellation on multiple New Glenn missions, Blue Origin announced Jan. 31. “Blue Origin’s powerful New Glenn rocket is a disruptive force in the launch services market which, in turn, will help Telesat disrupt the economics and performance of global broadband connectivity,” Telesat CEO Dan Goldberg said in a news release. Blue Origin already has eight other New Glenn missions in backlog: one each for Paris-based Eutelsat, Sky Perfect JSAT of Japan and Thai startup Mu Space, plus five launches for low-Earth-orbit megaconstellation company OneWeb. The rocket builds off of Blue Origin’s suborbital New Shepard rocket, with which the Kent, Washington, company has conducted 10 launches — one with a vehicle whose propulsion module crashed when landing, five with a second that launched and landed successfully each time before retiring, and four with a third New Shepard whose most recent launch was Jan. 23. Blue Origin said it plans to start launching astronauts using New Shepard this year. Telesat is preparing a constellation of roughly 300 communications satellites for global internet connectivity services. The satellite operator plans to select a manufacturer — either Airbus Defence and Space or a team comprised of Thales Alenia Space and Space Systems Loral — later this year. Both contenders said Jan. 24 that they completed systems requirements reviews for the constellation. In a separate Jan. 31 announcement, Telesat said Loon has agreed to deliver a network operating system design that Telesat can use to support its LEO constellation. Loon, a subsidiary of Google parent company Alphabet, said last fall it sees non-geostationary satellite operators as customers for a variation of the software-defined network it uses to deliver mobile connectivity via high-altitude balloons. “The addition of Loon brings an entirely new set of capabilities to the world-class supplier team Telesat has built for our LEO program – capabilities that will give Telesat a powerful competitive advantage in our global broadband service offerings,” Erwin Hudson, vice president for Telesat LEO, said in a news release. Meanwhile, Blue Origin and Telesat did not state how many satellites will launch per New Glenn mission. The answer will depend on the volumetric characteristics of the satellites and on the dispenser Telesat chooses. The rocket can carry 45 metric tons to low Earth orbit, and features a payload fairing twice the size of any other rocket on the market, according to Blue Origin. “New Glenn’s 7-meter fairing, with its huge mass and volume capabilities, is a perfect match for Telesat’s constellation plans while reducing launch costs per satellite,” Blue Origin CEO Bob Smith said in the news release. Blue Origin has announced more customers for its yet-to-launch rocket than any other company with a new vehicle under development. Several launch vehicles are set for maiden flights in the next few years, notably Arianespace’s Ariane 6 and Mitsubishi Heavy Industries’ H3 in 2020, and United Launch Alliance’s Vulcan and Northrop Grumman’s OmegA in 2021. Only Arianespace of Evry, France, has also signed up multiple customers for its new rocket. Arianespace has two Ariane 6 launches for the European Commission, and one for the French military. Eutelsat also signed a multi-launch agreement for five satellite launches on Ariane 6, though the agreement includes some flexibility with the Ariane 5. Arianespace CEO Stéphane Israël said in an interview earlier this month that the launch provider counts the Eutelsat contract as two full Ariane 6 missions, since Ariane 6 is designed to dual launch geostationary telecom satellites. Arianespace counts the missions collectively as five Ariane 6s in backlog. Mitsubishi Heavy Industries counts London-based Inmarsat as its first and so far only commercial customer for the H3. United Launch Alliance and Northrop Grumman have yet to announce customers for their next-generation vehicles, but will need to fly commercial missions in order to certify their rockets for U.S. Air Force missions. Blue Origin, United Launch Alliance and Northrop Grumman were all recipients of Air Force funding last year collectively worth roughly $2 billion to develop rockets that can launch military satellites.